Tsarki awakened with a jolt. Two enormous eyes and a giant, slobbering maw completely filled her field of vision. Giggling, she grabbed the monstrous form and lifted it into the shaft of morning light creeping through the thatched window. No longer an inch from her face, the “monster” appeared properly as a cute little Slorg. She bumped her dark snout affectionately against its mucousy forehead, then gently dropped it into a tray of wheatgrass on her nightstand. I was prepared for you, she thought with satisfaction. Slorgs were not uncommon here near the Berkshire Glen, on the outskirts of the Haunted Woods, where spooky trees gave way to shady meadows and spooky petpets of all sorts thrived. Tsarki knew she was in danger of becoming a “crazy Kadoatie lady” - or in her case, perhaps, a crazy Meowclops lady - but she just couldn’t help setting up feeders for the local critters. It made them so happy. Besides, it kept them out of the plants and mosses and mushrooms she used for potion-making, her literal cottage industry. Still, it was uncommon for a Slorg to get right in her face like that. Perhaps it was especially hungry, or just lost? As she whipped together her daily batch of Wakey Wakey Juice, her thoughts drifted towards her tasks for the new day. 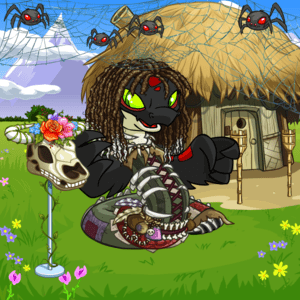 Breakfast, exercise, a relaxing afternoon of pewtersmithing, maybe a little “me” time touching up her weave … but first, breakfast for her spooky petpet companions. Outside, Tsarki recoiled at the sight of the feeder, making her braids snap back. It had already been a dry summer, increasing demand at her little petpet oasis, but today the feeder was spilling over with wriggling Slorgs, Sludgies, and Bloops. A Drugal tried in vain to groom her coat, tangled from brushing against her stickier neighbors. A pair of bedraggled Walking Carpets, a Gnar, and even a frazzled-looking Meepit all jostled for scraps. Tsarki’s snout curled in distress, baring her fangs. With as much speed as she could muster, she rushed to refill the feeder. What in Fyora’s name could be happening? Suddenly, a book fell out of nowhere into her wings. Startled, she needed a moment to read its title. A copy of De-Slorg Your Farm had practically fallen into her lap. She looked up and around, and quickly spotted the source: two Faeries, apparently in quite a good mood. The taller Faerie draped in diaphanous aqua robes alit near her, gingerly avoiding the feeder area. She kicked the turf in the direction of a stray Snorlkin, who promptly vanished from sight. “Oh, sweetie, it looks like we’ve come just in time.” Her comrade, an auburn-haired Fire Faerie, glanced at Tsarki’s circular thatched hut and the critter-laden meadow, and remained a few feet above the ground. Tsarki greeted them politely, unsure what was going on. “... and we just couldn’t be happier to meet our closer neighbors,” concluded Falana. She looked up and down Tsarki’s dress and decorative bone corset appraisingly. “Halloween chic, I see. Isn’t the local colour just so charmingly quaint? And I just love what you’ve done with your hair. Can I touch it?” Tsarki looked at her askance, and deftly pulled away in a gesture that could be taken for rapt interest in the contents of the basket. Nestled between packets of Cheese Flower Crackers and Delicate Faerie Nachos lay a can of Slorg-Be-Gone repellent and a lethal quantity of salt. “I really don’t think – “ began Tsarki, finally managing to get in a word edgewise. “That dreadful Nox, that incompetent Neovian mayor, and those encamped vagabonds – “ spat Kalpana from above. “Things will be so much better with a little cultured influence. You’ll see,” Falana chirped brightly. Tsarki took in a long, slow breath, and lengthened her Hissi spine to her fullest height. “It’s very kind of you to come by,” she began. “Oh, think nothing of it, dear,” Falana offered ingratiatingly. “And that’s why we’re going to show you a better way, dearest,” cooed the Water Faerie. “What did you expect from her kind, Falana?” sniffed the Fire Faerie. “Sad but true, Kal, but we had to try.” The Water Faerie clapped her hands overhead. The air seemed to dry out as a Gormball-sized ball of moisture appeared in midair. The water sphere arced down onto the feeder, sending even the stickiest petpets scattering. A drenched Droolik rolled alongside Tsarki, who cradled it in her tail. Seething, the Hissi raised her staff, which began to radiate with arcane energy. “We’d best be on our way,” snipped the Fire Faerie, “but heed us, little pet. We’ll be back… for your own good.” The two Faeries darted off with a burst of flame and dew, leaving a charming rainbow trail in their wake. Tsarki didn’t lose her temper easily. The pounding of her blood along her neck was an unfamiliar sensation, but it ebbed as quickly as the rainbow sparkles in the air. This… was going to be a problem. Tsarki was not without skills, magical and mundane, but her potions and magics were no match for one faerie, et alone two. And what if they came with reinforcements? Tsarki’s teeth ground together as she fretted and mulled the situation. Perhaps Sophie, or Edna, or wise Gorunda, or even Eliv Thade might help… but their help would come at a cost, and there might not be time. A curse, perhaps? Tsarki didn’t much care for curses, as a general rule. In her opinion, the only real difference between curses and other magic was intent, and the anger and bitterness required for a really good curse, especially one strong enough to thwart two faeries, would come at its own cost. Tsarki scooted at full speed to her workshop, giggling as she went. When the Faeries returned, Falana had changed into a ruffled chiffon gown of seafoam green. Clearly, she meant business. Kalpana trailed behind her, scouting the area suspiciously. Tsarki emerged from her strategic hiding spot behind a Gnarled Tree of Barbats. She wrapped her staff sharply against the ground, sending a cloud of Barbats into the air. The Faeries squealed despite themselves as they dodged the leathery vermin. Kalpana scoffed. “Is that all you’ve got?” She lifted her Wand of Flamebolt, whose center suppurated as though filled with orange lava, and leveled it menacingly towards the Hissi. Tsarki soared high above, spreading her wings to their fullest, eclipsing the sunlight from the two faeries. In her most stentorian voice, she intoned, ”You leave me no choice! She pulled a shining paintbrush from her belt and shook it violently down towards the faeries, spattering them. ”I call down the Curse of the Neopox Paintbrush!”! The faeries looked up at the Hissi with a mix of scorn and amusement. “And what makes you think a Faerie can be painted?” laughed the Fire Faerie, brushing the stray droplets off her arms and shoulders. The faeries looked at one another and gasped. Their bodies - clothes and all - were covered in scabrous red spots. “This can’t be!” shrieked the Water Faerie, casting a cleansing spell, to no effect. “It itches! It itches! Get it off!” panicked the Fire Faerie. Tsarki lifted her hands, wings akimbo, as though holding an invisible box filled with gathering arcane power. The faeries bolted. As they receded from sight, Tsarki sighed, and flew down to the mahogany tree. Tsarki knew that it wouldn’t be long before the faeries discovered her ruse. She had gambled that the Faeries would be so used to magical paint brushes that non-magical paint wouldn’t even occur to them, especially with Tsarki’s misdirection. Still, she suspected the faeries would be loath to admit how easily they’d been fooled… and in the meantime, she had friends with connections in Faerieland. If she was quick and clever, she’d have a chance to protect her home on a more permanent basis.